The term cremello is not actually a breed of horse. This is actually the color of a horse coat. 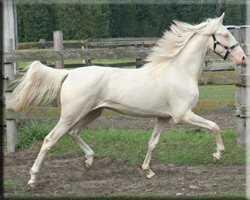 Most of the time, cremello horses for sale are horses that have a cream color body with a cream, or sometimes even a white mane and tail. 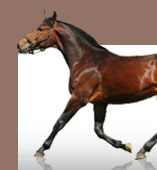 This is a type of coloring that happens after the horse is homozygous for a dilution gene. This is a gene that a lot of farmers and other people call the cream gene. Many people do not know this, but this is a gene that actually acts on a red, or chestnut colored coat. Usually the horses that have these kinds of genes are going to have pink skin. On top of that, most of the cremello horses are going to have blue eyes as well. Some of the horses will get a gold color to their coat when they are first born. However, this is not a color that you should grow attached to, because it is a color that will normally fade to white as the horse grows in age. Although most people do not want the gold color to fade, there is not much that you can do to stop this change. It’s just like how human hair changes over time as well. It is important to note that a cremello horse is not a white horse at all. A white horse and a cremello horse can be hard to tell apart sometimes. That is because the white horse can have the pink skin as well with the brown or blue eyes. If you see a horse that you think is a cremello with brown eyes, then it is not a cremello. That is because cremellos can only have the blue eyes. The good news about the cremellos is that they do not have any of the genes that are needed to produce a true white coat. This is great, because that means that they are not a carrier of lethal white syndrome. Also, try not get albino horses mixed up with the cremello horses as well. These are horses that do not have a white coat, and they have no pigment in their eyes. A horse that is actually a true albino horse is said to be a carrier of the lethal white gene, and thus, they do not mate. It’s also important to note that, a lot of times, the Cremello horse can look a lot like the champagne horse and have the champagne gene in it. Not only that, but they can have the pearl gene in it as well. You should note, however, that the champagne horses are different from the cremellos. This is because the champagne horse normally has mottled skin and striping on their hooves. Not only that, but their eyes are usually a dark yellow green or sometimes hazel. Either way you look at these horses, they are pretty amazing horses, and a type of horse that you are going to want around your farm. If you want a horse that has the champagne color or the pearl color, then you will notice that using cremello horses is a good way for that to happen.